Tell us about your aspirations and field of study. What are you doing now? I am a Preventive Medicine PGY-2 resident at the University of Massachusetts Medical School. Preventive Medicine is a unique field that combines clinical medicine and public health, following a minimum of an internship year, which I completed at a Family Medicine program. I focus on HIV/STD prevention and treatment and LGBTQ health, spending about half of my time working on quality improvement and implementation projects at the Massachusetts Department of Public Health, and the other half on a mix of clinics, seminar, and public speaking, consulting, and writing projects. What kind of hearing loss do you have and what is your preferred and primary communication method? I was diagnosed with bilateral sensorineural hearing loss as an infant, which is now partially mitigated through bilateral cochlear implants. To compensate, I’ve used it all - speechreading, listening through my cochlear implants, and Cued Speech (Cued English) or American Sign Language. Since English is my native language, I voice for myself except with other ASL users. 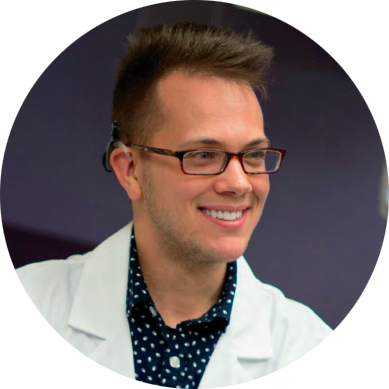 In your applications for medical school and residency, did you reveal your hearing loss? My philosophy was to reduce barriers and also to demonstrate my unique contribution to diversity by disclosing. Theoretically, if a program had difficulty with an applicant with hearing loss, then I would not be offered an interview, but if a program also saw the value of having a potential physician-in-training who could contribute a different perspective, then all the better. However, the framework changed over time -- initially I discussed how the cochlear implant process taught me the benefits of medicine done well, and later evolved to discussing the value of serving our community. What resources and accommodations did you use during medical school? During medical school, I began with an FM system and then added CART for classroom lectures and “oral sign-supported interpreters” for anatomy lab. At the time, I didn’t know ASL so they were primarily mouthing everything while I used my fledgling knowledge of basic signs to keep up. Third and fourth years were fun and required adaptability. For instance, I had my first month of inpatient Internal Medicine rounds covered by a fabulous CART provider, Mydge Heaney, which gave me time to become more comfortable with ASL for ensuing rotations. Do you have any advice regarding resources and accommodations used during your medical education and residency? Anticipating all of your needs is hard because health training programs often present new and unpredictable auditory challenges. Navigating and advocating your communication needs is challenging especially when an exhausted resident at the end of a 70-hour week. In the future, your needs might be less (or the same), but right now is your time to learn and your time to shine. Start a dialogue early. Unfortunately, high quality accommodations are often scarce. Funding has to be allocated and approved by the institution, even for a one-time technology order. Equipment may need to be ordered and adjusted. CART providers or interpreters may need to be recruited from afar. They need time for the behind-the-scenes work of scheduling, immunizations and credentialing, and learning vocabulary. Did you set up your current residency with any particular accommodations? I have videophones set up on my computers (which have been disabled several times with surprise replacements or new operating systems, requiring a lovely conversation with IT each time), one Designated Interpreter for meetings and clinic, my ThinkOne Labs stethoscope, and wireless/Bluetooth accessories for my cochlear implants. Any funny or inspirational stories? On an Emergency Medicine rotation during my fourth year of medical school, I walked into a patient’s room ready to evaluate a middle-aged fellow, who had his own long journey navigating physical disability. I hardly remember his chief complaint now, but he was so excited to see a physician with a disability that he asked for a photo of us together. I wonder if he still has that photo! The following year, as an intern on the OB ward, I rushed to the side of a deaf woman who had told the EMTs she was bleeding from a potential miscarriage. Nary a drop of blood was visible, and an ultrasound showed an IUD, one that had been placed there on order of her father. She followed up with me just once in clinic, moving out of the city a few weeks later, but I had the luxury of spending an hour discussing her reproductive system and rights. I sincerely believe she showed up just because I was a fellow deaf person. We, just by existing as deaf and hard of hearing people in healthcare, change others’ paradigm of ability. I only hope that these two patients left that day feeling empowered. Any last words of wisdom or advice? When considering accommodations, many people consider achieving hearing-like status ideal. While often achievable for some people with hearing loss, this implicitly reinforces the expectation that subsequent candidates with hearing loss also meet that expectation. Instead, we might choose our words to include all of our community members, from those who blend in easily to those who are indefatigably Deaf. Together, we can utilize our experiences of hearing loss (plus other identities) toward engendering a beautiful amalgam of creativity and innovation. Newer PostAnnouncing the newly elected Board of Directors for the 2019-2021 term!